The promoters for the CD&M got their start with the 1901 purchase of the Columbus Clintonville and Worthington Railway, a streetcar line that ran from Arcadia Avenue in Columbus to Worthington. They also purchased the street railway in Delaware. Private, mostly 20' wide side of the road right-of-way was acquired between Worthington and Delaware, Delaware and Prospect, Prospect and Marion. Street running, rather than private right-of-way, was used from the interurban station on West Gay Street (later moved to Rich and Third Streets) in Columbus to Worthington. Delaware, Prospect and Marion also had street running. The CD&M operated streetcar service in both Delaware and Marion. They may have also operated streetcar service from Arcadia Avenue to Worthington in the beginning. The CD&M was completed and in full operation on March 10, 1903. In 1908 the CD&M built a subsidiary, the Columbus, Marion and Bucyrus Railway. The 18 mile CM&B connected the CD&M with the Cleveland Southwestern & Columbus Railway in Bucyrus providing an all electric railroad route between Columbus and Cleveland although they were never operated as one railroad. They did provide for freight service between Columbus and Cleveland. Passengers, however, had to transfer at both Marion and Bucyrus. When the CS&C failed in 1930 the CD&M lost its freight traffic link to northern Ohio leading in part to its own failure in 1933. When the CD&M was built in 1903 it ran in city streets from Worthington to Columbus, about 10 miles. (To view a map of the CD&M's route into Columbus click on the map above.) 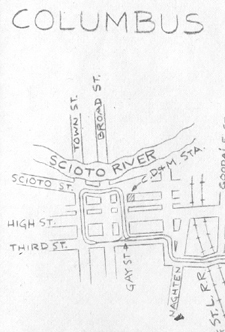 In 1923 a 6.5 mile bypass was constructed to take the interurban cars off High Street. In 1926 two heavy weight steel parlor cars, the #500 and 501, were purchased from American Car and Foundry. These were run on limited schedules providing first class service. In 1927 a fire at Stratford destroyed car barns and the original CD&M power plant which in 1927 was used as a reserve power plant. This left only the paint shop standing. By the time the CD&M stopped operation in the fall of 1933 it had changed its name to the Columbus Delaware & Marion Electric Company. Its electric business was profitable. The company's coal fired power plant on the out skirts of Marion was 7 1/2 miles from an interchange with the C&O RR in Marion. The power company known as the Marion-Reserve Power Company kept three electric freight motors in service until 1952 when they were replaced with one diesel. The Columbus, Delaware & Marion Electric Co. - Office, No. 8, I.O.O.F. building, Marion, Ohio. Connects Columbus, Worthington, Lewis Center, Stratford, Delaware, Prospect and Marion; also owns and operates the city railway service in Marion and Delaware. Total power station equipment - four AC General Electric, Westinghouse with total 16,750 kva. 13,200 & 2300 volt 3 phase, 60 cycle; 4392 hp boiler Babcock & Wilcox Heine; 13,750 kw steam turban General Electric, Westinghouse; trolley voltage 600 volts. Five sub-stations (three with automatic control) total capacity 2600 kw; six rotary converters. Power Stations at Scioto and Marion. Reaches Glenmary Park, Worthington (owned by the CD&M), Olentangy Park, Indianola, and Smith's Park, Columbus.